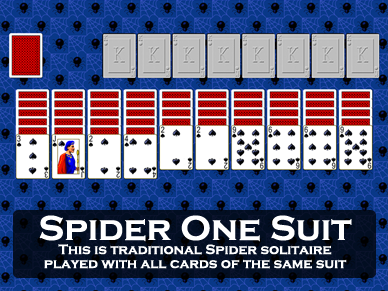 Click on the screen shot of the game Spider from Pretty Good Solitaire to download the 30 day free trial version. 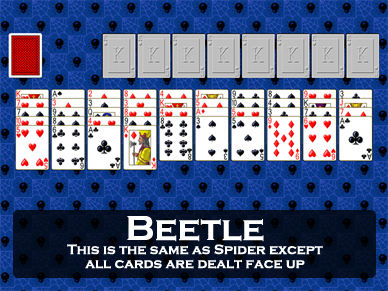 Spider is a classic difficult 2 deck solitaire game that was included in older versions of Windows. It is a difficult game of skill. My version of Spider in Pretty Good Solitaire allows you to play offline, full screen, with complete undo and my unique right click quick move. It's the best way to play Spider! And it comes with the easier Spider One Suit and Spider Two Suits as well! Spider for Windows 10 or Mac! In this video I explain how to play Spider. Download Spider Now and play along! There are 10 tableau piles and while the piles can be built down regardless of suit, only groups of cards built down by suit can be moved together. 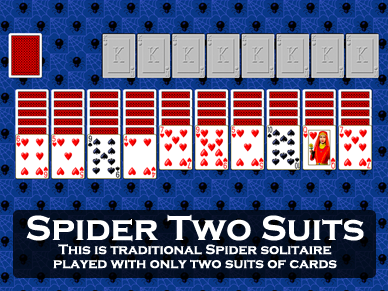 Spider differs from most solitaire games in that there are no foundation piles. When a group of 13 cards in descending sequence down by suit are grouped together, they are removed from play. The object is to remove all the cards from play. The cards that are not dealt out at the start are held in the stock. When there are no more moves in the tableau, one card is dealt to each tableau pile from the stock. It is very easy to get blocked in Spider. You can get blocked when you build out of suit, or when cards get dealt from the stock onto a sequence. Therefore it is critical to build in suit as much as possible. Empty tableau piles (spaces) are extremely valuable and can be used to help moves cards around, but you must fill all spaces before dealing from the tableau. The average player wins Spider about 10% of the time. A good player can win about 33% of the time and a really good player can score 50%. But it appears that a really excellent player who makes extensive use of undo can score nearly 100%. It is possible that nearly every Spider game is winnable and that Spider may be nearly completely a game of skill. 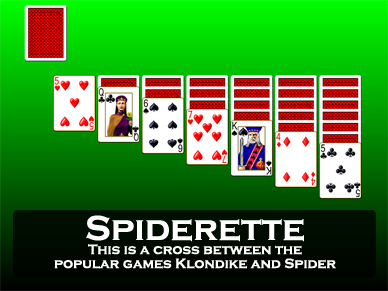 With the release of Windows ME, Spider became the 3rd solitaire game to be included with Windows (joining Klondike and FreeCell). This has greatly increased Spider's popularity. Because Spider is so difficult, the Windows program adds two easier levels of play, which are called Spider One Suit and Spider Two Suits. 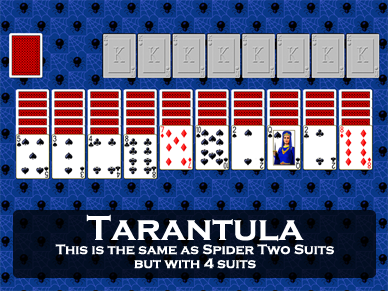 One Suit makes Spider easier by making all the cards of same suit, changing the game so that moving groups no longer depends on suit. 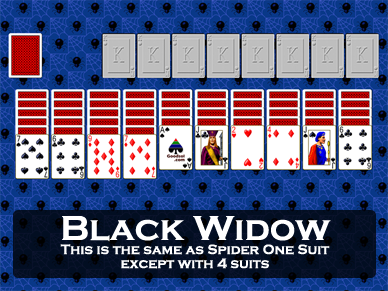 As a solitaire purist, I find this changing of a deck of cards into just one suit somewhat blasphemous, but it is essentially the same idea as the Spider variant game Black Widow in Pretty Good Solitaire. Black Widow is the same as Spider except groups of cards can be moved regardless of suit. This makes the game much easier. Two Suit is the same idea except there are two suits instead of one, meaning cards can be moved regardless of color. Another related game is Tarantula. This game is the same as Spider except groups of cards can be moved if they are in descending sequence of the same color. You can download the free 30 day trial version Pretty Good Solitaire now. 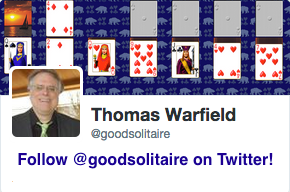 You can play all the games in Pretty Good Solitaire with game numbers 1 to 11982 for 30 days. If you like it (and I know you will), you can buy the 1001 games here and get years of fun. 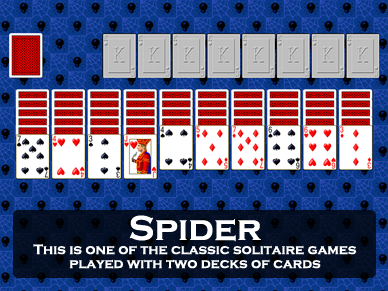 If that is too much, Spider is also in our cheaper and smaller game Most Popular Solitaire (30 games). You can download the free 30 day trial version of Most Popular Solitaire here. You can follow me on Twitter or see pictures of my cats on my blog. Buying my games keeps my cats in the tuna treats they love. Regardless, I hope you enjoy my games! "I purchased Pretty Good Solitaire over two years ago and we still play it every day. My children play it, my husband plays it and we're never bored! Just when you think you've mastered all the games they send you an update with new ones. 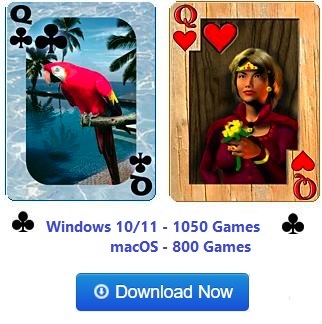 It's the only solitaire game to own."